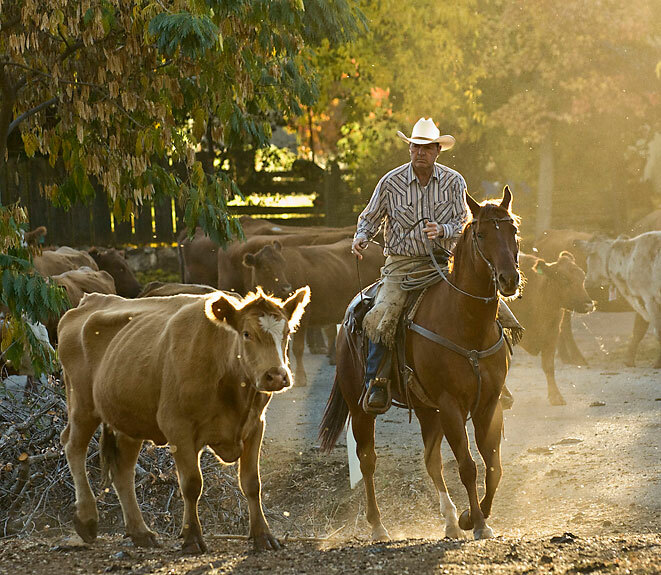 For over a hundred and twenty years, the Erickson family has been driving their cattle from the Merced Falls area to summer grazing near the border of Yosemite National Park. The drive takes the same route; of course there are three major highways now not to mention a bridge over the South Fork of the Tuolumne River. The last six years, I have been following the drive. 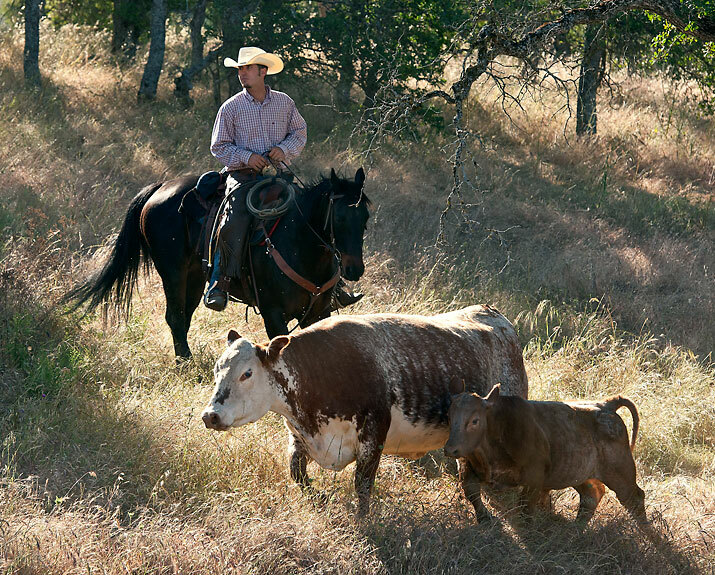 If you would like to see more of my images of the Erickson Cattle Company drive click here for my Photoshelter gallery. 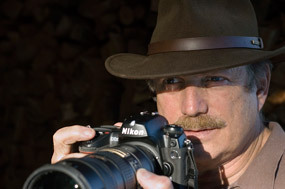 October 23, 2008. 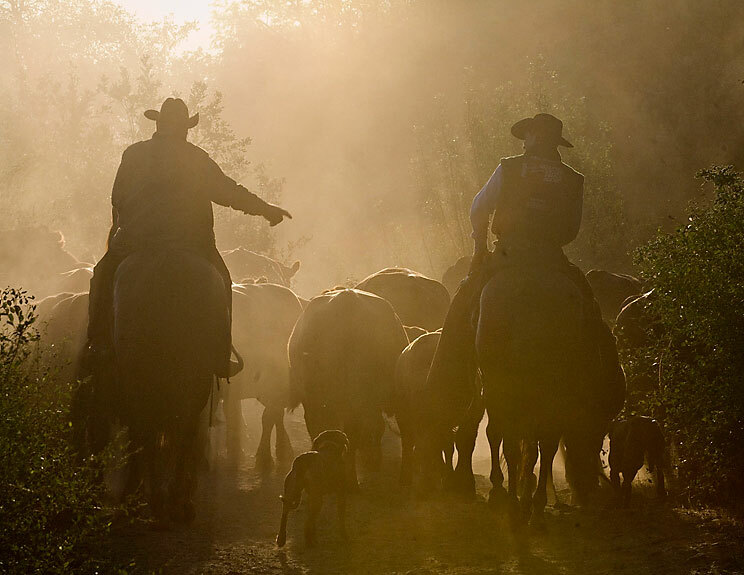 Near Lake Don Pedro subdivision a cowboy and his dog move cattle along Highway 132 toward Merced Falls Road and a rock corral. October 26, 2006. 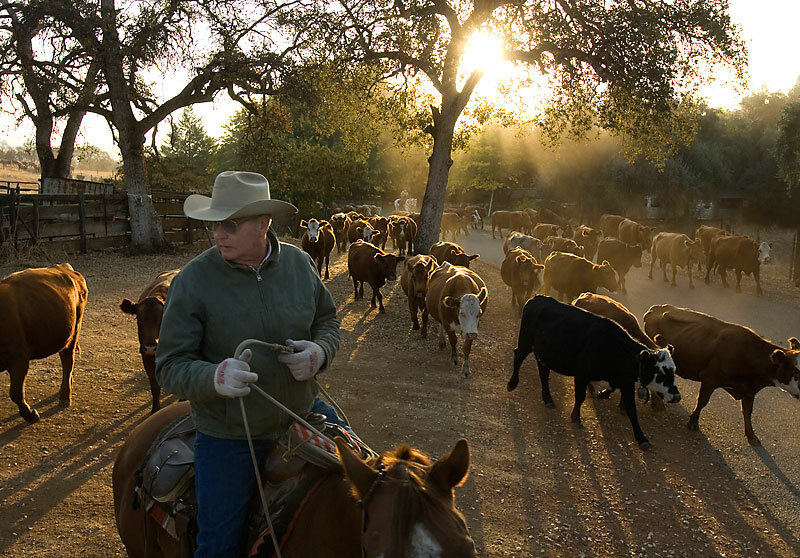 After the herd spent the night at Uglow Ranch on Penon Blanco Road, Chuck Shepard watches cattle carefully to make sure the cows stay together while they move though the Lake Don Pedro subdivision. May 12, 2008. 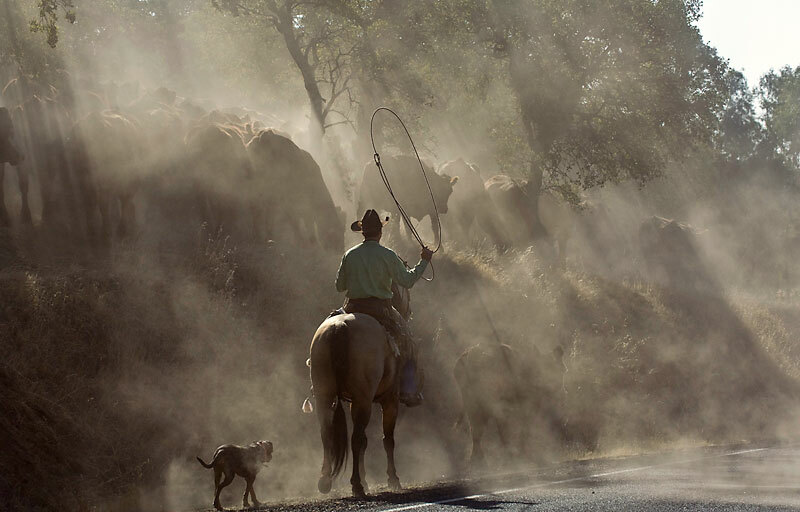 Cowboy moves cattle up Cuneo Road after leaving Boneyard Creek corral. October 23, 2007. After coming over Dante Pass Road from Kassabaum Meadow cows move down Cuneo Road. May 09, 2008. 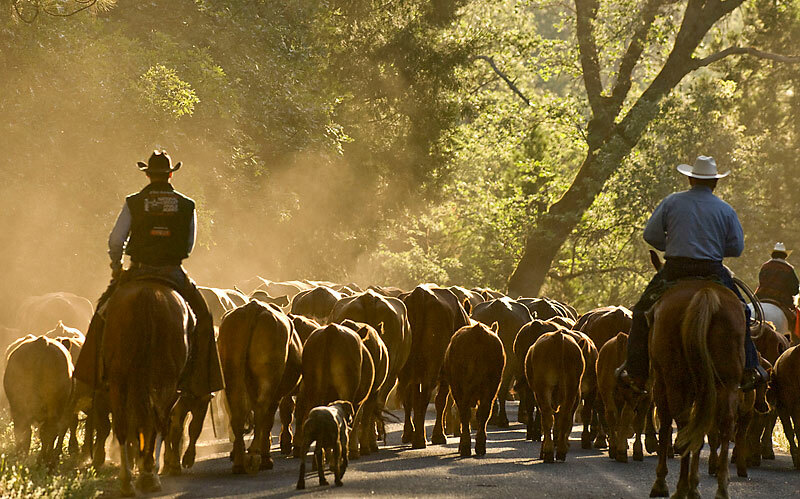 Cowboy moves cattle down Merced Falls Road heading to Uglow’s Ranch on Penon Blanco Road. May 08, 2008. 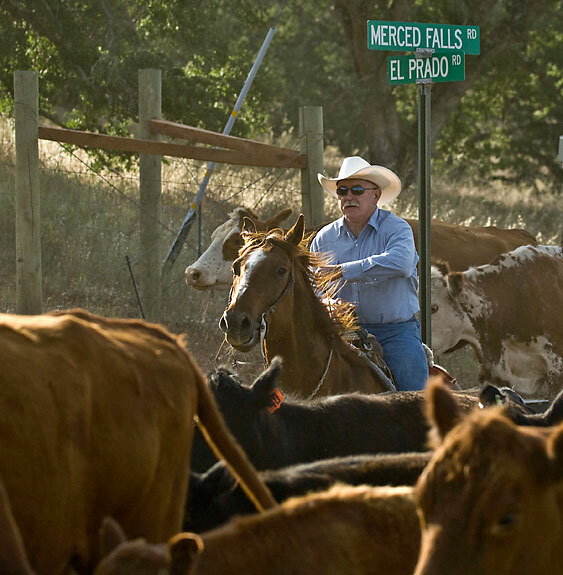 Jack Kiernan works quickly to keep cows together on an open part of Merced Falls Road. May 09, 2008. 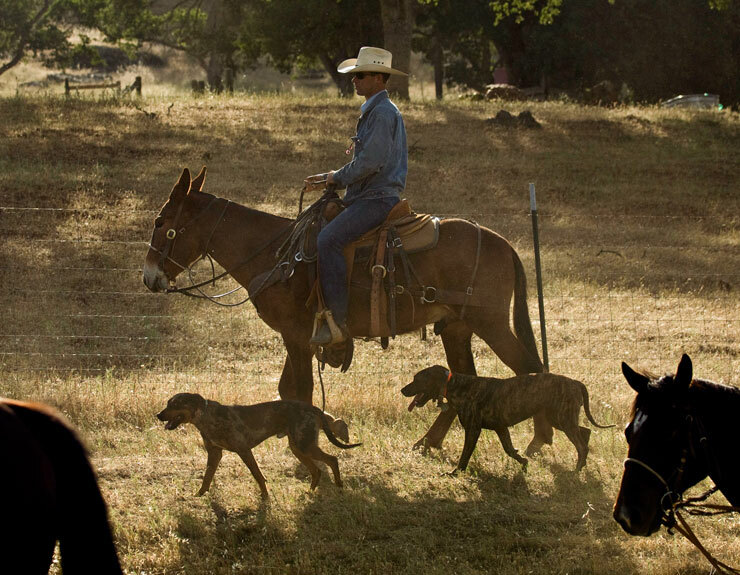 Dan Erickson and his dogs keep cattle organized along Merced Falls Road. May 31, 2007. 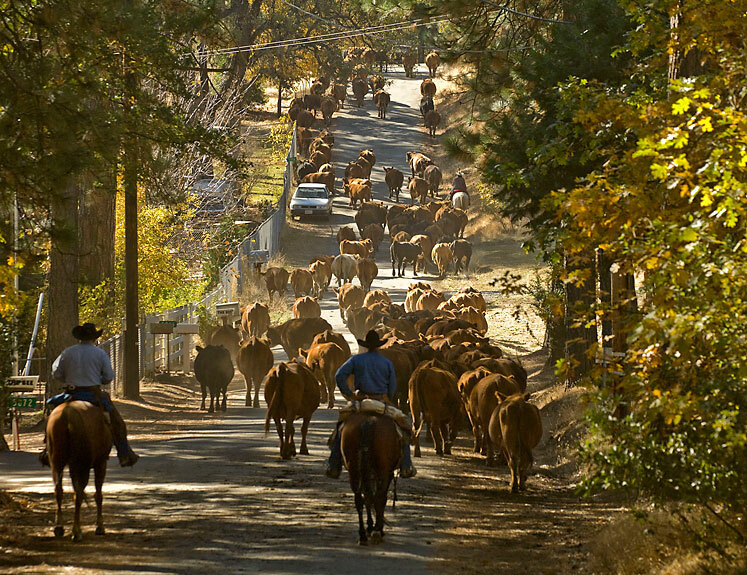 Cowboys move cattle down dusty Forest Service road to Lumsden Bridge to cross the Tuolumne River. June 9, 2005. 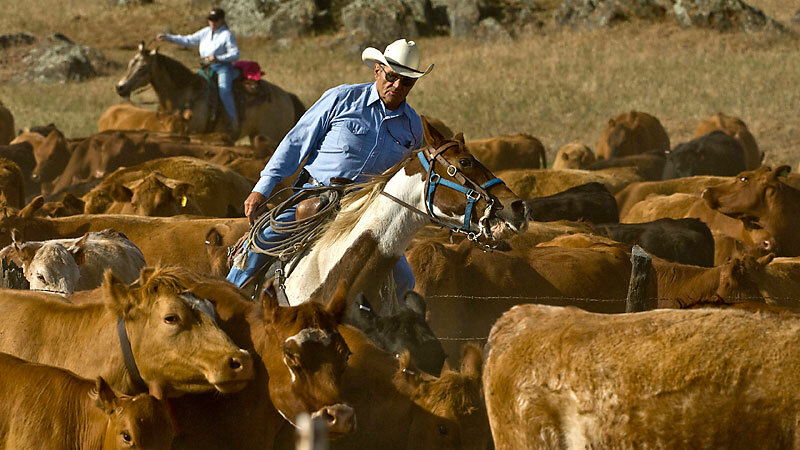 Erickson Cattle Company drives cattle on the Highway 120 bridge over the South Fork of the Tuolumne River near Buck Meadows, California. October 26, 2006. 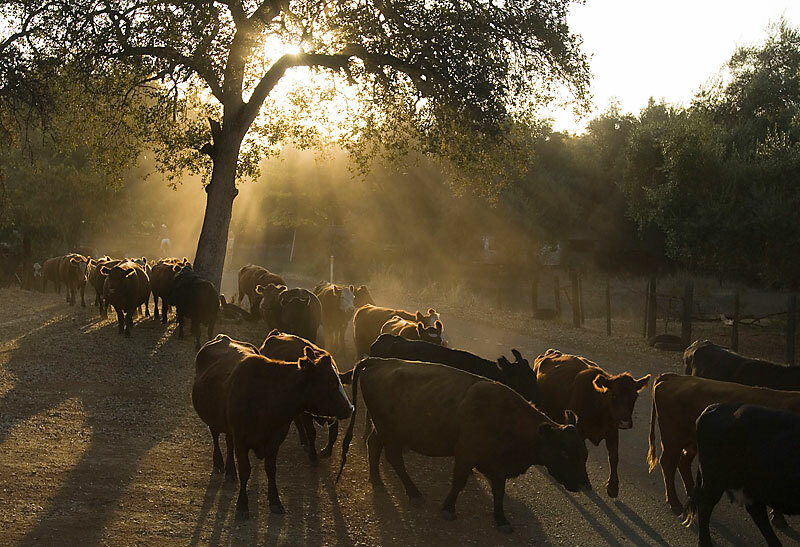 After the herd spent the night at Uglow Ranch on Penon Blanco Road, cattle come to Granite Springs Road intersection before going through the Don Pedro subdivision. October 24, 2006. 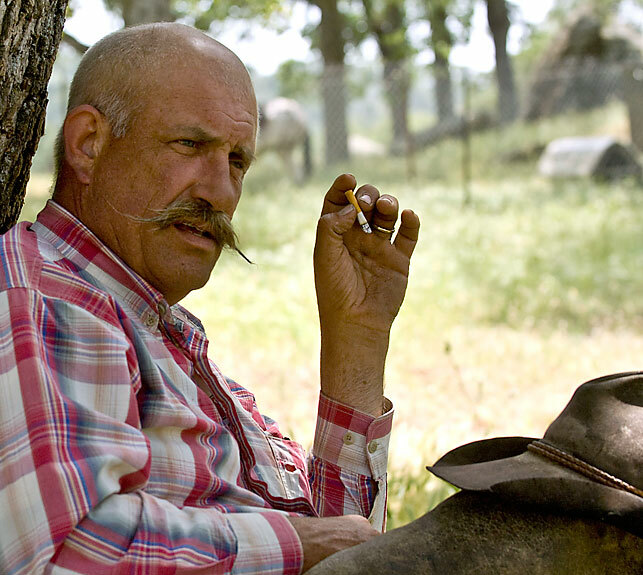 Les Weidman works cows along Hell’s Hollow Road after herd crossed Highway 120 from Kassabaum Meadow. October 25, 2007. Jeff Prosser moves cow back to herd along Penon Blanco Road. October 25, 2006. 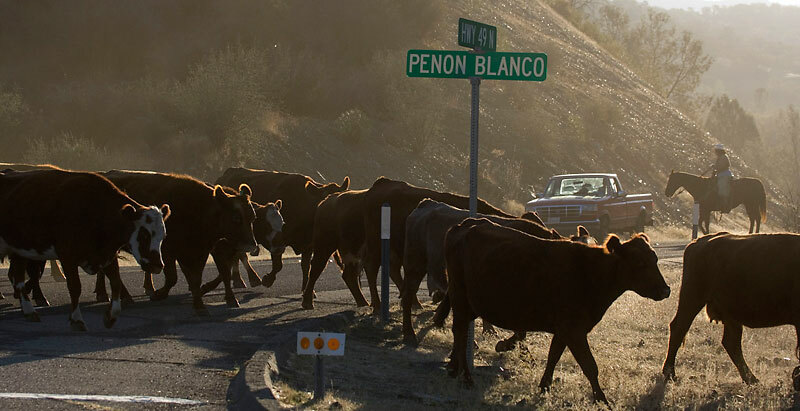 While Barbara Silva holds traffic, cows cross Highway 49 at Penon Blanco Road. June 15, 2005. 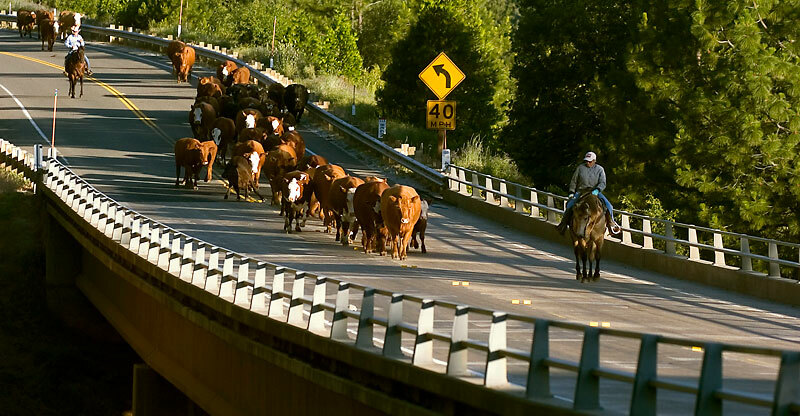 Traveling from Buck Meadows to Packard Canyon, cowboys move cattle over bridge on Highway 120. October 26, 2006. 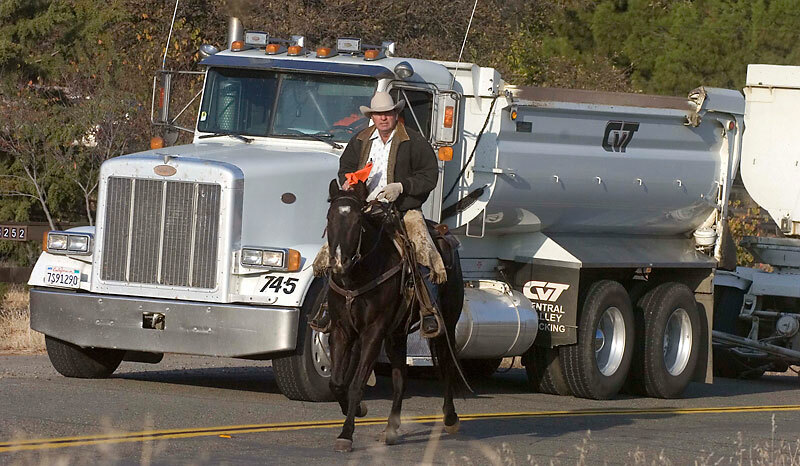 Jeff Prosser controls traffic while moving cattle through Lake Don Pedro subdivision. May 11, 2011. In springtime, calves want to stay with their mothers on Merced Falls Road. May 09, 2008. Cowboy Jim Short takes a break before chuck wagon style lunch is served at the Uglow Ranch. May 27, 2011 - 9:09 AM	Wes - It's so much fun!!!! May 17, 2017 - 8:24 AM	Al Golub - You will need to contact Erickson Cattle Company in Snelling California.